Weighty Matters: Jamie Oliver - the video game? You know I love Jamie Oliver. I even emailed his publicist once to let them know that if they were ever looking for an outspoken obesity doc to work with him, I'd be there with bells on. Anyhow, not to diss Jamie or anything but what's up with What's Cooking? 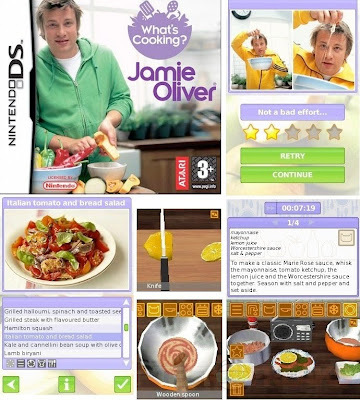 Jamie Oliver, a new game for the Nintendo DS. I mean if you've actually got the time to sit and practice "shopping", "chopping" and "dressing the dish" on your Nintendo shouldn't you simply be cooking? Not sure where Jamie was going with this license. Let's teach kids to pretend cook? Let's teach kids to experiment in the virtual kitchen where tastings a bit challenging? Let's teach kids to waste their time on a gaming system so that when it's dinner time there'll be no time to actually cook and they'll need to order take out or nuke something? I suspect the point was an interactive cookbook, but given the wealth of online, interactive cooking resources and Jamie's own along with lord knows how many other TV cooking shows, I'd say this is overkill. Sorry Jamie, I love your work but this endeavour seems off to me. "After the first few recipes, you quickly realize that this is a game of rolling through monotonous motions. Long before the game is finished, you will become very bored and have no desire to return."